A rich, herby, gooey gravy makes this simple beef stew ideal for a family dinner on a chilly evening. It takes only 15 minutes to prepare, after which it's kicked into the oven and left to burble for a good three hours, or more. Browning cubes of meat is tedious, but this caramelising of the meat's surface does help to give the sauce a lovely depth of flavour. However, I've found that you don't need to brown the whole lot: you can get away with browning just a third of the beef cubes (or enough of them to create a sticky brown layer on the bottom of the pan). Any good stewing beef will do for this recipe - chuck, blade or skirt - but I like it best using boneless shin, which doesn't go stringy after a long cooking time. The gremolata of finely minced lemon peel, garlic and parsley adds a final sparkle to the stew, but do prepare it - and sprinkle it on - at the very last moment, so that the heat of the stew releases a billowing cloud of zesty aromas. The carrots are added in two stages: if you put the baby carrots in at the beginning, they'll turn mushy and brown. This stew contains a quite lot of flour (I can't bear a stew with watery gravy); if the sauce is too thick, thin it down with extra wine or water. You can prepare this dish in advance, and reheat it at supper time (in fact, like all stews, it's better the day after). Preheat the oven to 160°C. Remove any stringy bits from the beef and cut into large cubes. Heat the oil over a brisk flame in a large, shallow oven-proof dish or casserole. Put the flour in a bowl and season with salt and pepper. Add the beef and, using your hands, toss well so that every cube is coated. When the oil is hot, add a third of the beef cubes and cook, over a brisk heat, until they are crusty and golden brown. (You can brown all the meat in this way, if you have the patience.) Remove from the heat and set aside. Turn down the heat slightly and add the onion, carrot, celery and garlic. Cook for a few minutes - without allowing the garlic to brown - or until the vegetables are slightly softened. Now add the red wine, tomatoes, tomato paste, soy sauce and all the herbs. Stir well to combine, scraping to release any sediment on the bottom of the pan. Return the browned beef and its juices to the pan, along with the rest of the meat and flour, and cook for a minute, stirring well to prevent lumps forming. Add just enough hot water to cover the beef and vegetables to a depth of 5mm. Check the seasoning and bring to the boil, stirring well. Cover the pot with its lid (or a double layer of tin foil) and place in the middle of the oven. Cook for an hour, then turn the heat down to 150°C and cook for another hour. 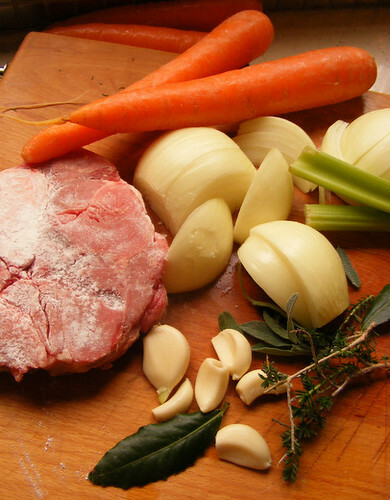 Remove the pot from the oven, stir in the baby carrots, cover and return to the oven for another hour, or longer (your cooking time will depend on your oven and the cut of beef you're using; the stew is ready when the meat is fork-tender, and the carrots are tender). To make the gremolata, finely grate the lemon zest and the garlic (a microplane is perfect for this job) and finely chop the parsley. Combine in a small bowl. Just before serving, sprinkle the gremolata over the hot stew. Lovely with hunks of bread or mashed potato. st finihe a 5kg rump and now I want to eat this.....heibo!!! Sorry Juno, I wanted to say "Just finished a 6kg rump....don't know what happenened? That makes me feel like winter's here already! Hmmmm looks so delicious! Scrumptious indeed! The rich gravy, generous herbs, and clever gremolata to finish, all make for a Superior Stew. My oddball household gave it the highest rating possible: lip-smacking, bread-mopping and, alas, plate-licking. The first time I followed your recipe exactly and left it to bubble away for three hours plus in the oven. Since then, I've made it a couple of times using a pressure cooker to start, and the results have been even better. The pressure cooker -- a compact electric model in this case, not the great-aunt's locomotive boiler -- seems to extract much of that better-the-next-day goodness in very little time. A couple of suggestions? A handful of chopped leeks in the mirepoix can add a subtle sweetness to the gravy. Have you tried sauteeing the tomato paste for a minute or two with the aromatics? Seems to add some deeper savoury flavours to balance the bright tomato. theme: how about coming up with a Better Bredie? Most of the tamatiebredie recipes out there are dire: watery, greasy, and tasteless. Thank you for these thoughtful and expert comments, Steve. I really like the idea of adding leeks, and of course - thank you! - the tomato paste should be bubbled for a while. I am intrigued by your knowledge of stew, and suggest that you come up with a better bredie, which I'll so happily post here. I have no experience at all in the bredie department.